This is the Best of Show recipe in the Master Division of the 2008 Santa Cruz County Farm Bureau 31st Annual Apple Pie Baking Contest. This is the Best of Show recipe from Maggie Kasunich of Watsonville. Maggie won First Prize in the Master Division of the 2008 Santa Cruz County Farm Bureau 31st Annual Apple Pie Baking Contest. Sponsored by Santa Cruz County Apple Growers, Producers & Pie Lovers. 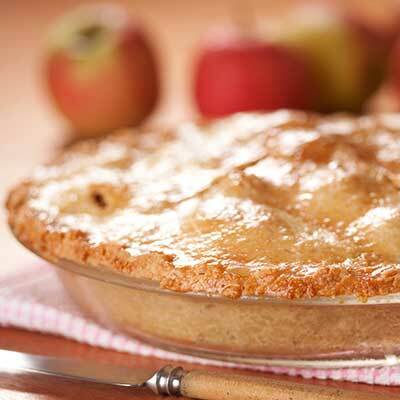 Mix the apple filling and crust ingredients in separate bowls. Mix and roll top and bottom crust between waxed paper. Line the pie plate and fill with the apple mixture. Bake for 1 hour at 350 degrees or until apples are tender. Maggie Kasunich of Watsonville won First Prize in the Master Division of the 2008 Santa Cruz County Farm Bureau 31st Annual Apple Pie Baking Contest. Sponsored by Santa Cruz County Apple Growers, Producers & Pie Lovers.